Soil fertility is a key component of soil productivity and a crucial aspect of soil quality as well. Assessment of a soils fertility status involves an estimation of its available nutrient status. 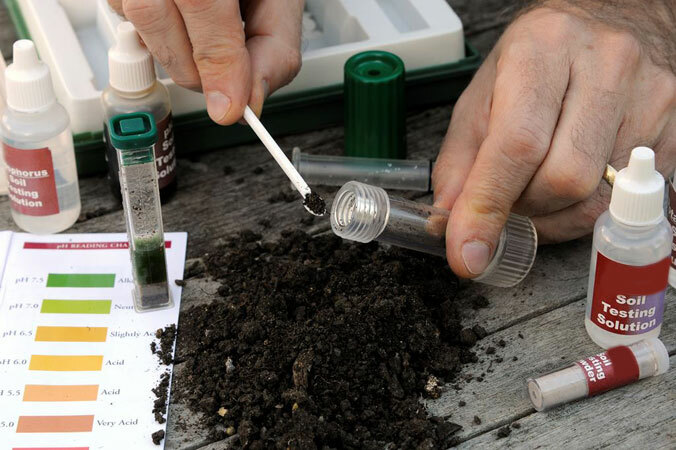 This exercise is commonly referred to as soil testing and used by farmers around the world to arrive at optimum fertilizer application rates. The need for estimation of “available” nutrient arises because only a small fraction of the total nutrient content is in the plant available form which too is not directly proportional to the total nutrient content of the soil. Soil tests are calibrated by correlating them with crop response and the results form the basis for making fertilizer recommendations. Establish the current nutrient status of the soil to provide the basis for future strategies. Indicate the ameliorants required to correct a soil’s possible physical and chemical property imbalances. Determine factors that may be limiting crop production. Identify opportunities to improve farm profitability through efficient soil fertility management. Develop an appropriate nutrient plan for the farm based on productivity targets. Monitor the progress of nutrient strategies over time and indicate any need to fine-tune inputs. Determine the better fertilizer form &/or application method to suit particular situations. Assists in the planning process through improved budgeting of farm financial resources. Better farm management through more cost effective nutrient decisions. Physical Parameters: Water Holding Capacity, soil texture % (as per mechanical analysis) sand/clay/silt/texture category, soil type, porosity. Chemical parameters: pH, Electrical Conductivity (EC), Calcium Carbonate, Organic Carbon, Sodium Adsorption Ratio (SAR), Exchangeable Sodium Percentages ( ESP). Major Nutrients: Nitrogen, Phosphorus, Potassium. Macro Nutrients: Calcium, Magnesium, Sulphur. Micro Nutrient: Sodium, Copper, Zinc, Ferrous, Manganese, Boron, Molybdenum. As is often emphasized, the soil sample collection for analysis should be representative of the area sampled. A field can be treated as single sampling unit only if it is uniform in all respects. Variation in slope, texture, colour, crops, grown and unusual spot should be taken into account while sampling a field and such areas should be sampled separately. Recently fertilized plots, bunds, channels, marshy tracts and spots near trees, wells, cattle dung and compost piles or other non representative location must be avoided during sampling. If fertilizer has applied through band placement, either the field is to be ploughed before sampling or sampling done between the crop rows, well away from fertilizer bands. When crops are planted in rows, samples can be drawn in between the lines unless a fixed row is ploughed and sown year after year. The soil sample should be taken in a zigzag pattern to cover the field. A representative composite soil sample can consist of 8 to 20 sub sampled from uniform field. For most field crops, a sampling depth of 15 – 20 cm is desired. For a pasture crop, a 10 cm depth is normally sufficient. For a deep-rooted crop like sugarcane, cotton, horticultural crops or under dry farming conditions, samples from different depths or layers may be needed. Under intensive cultivation (2 or more crops / year) sampling should preferably be done every year. If one crop/year is raised, sampling once in 3 years is sufficient. Sampling should be done at the same time each year. For sampling soft and moist soil, the tube auger, spade or khurpi is quite satisfactory. If a spade or khurpi is used, first a V-shaped cut is made up to the plough layer and then a uniform 1.5 cm thick slice taken out. The collected sub samples should be thoroughly mixed on a clean piece of cloth, polythene sheet or thick paper and bulk reduced by the quartering method so that about 500 gm of composite sample is retained. The sample must be kept in a cloth or polythene bag with suitable description and identification marks as described elsewhere.